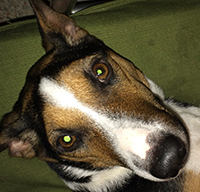 Should your Basenji be affected by an eye condition such as Columba, Corneal Dystrophy, PPM or PRA, consider taking your dog to an Ophthalmologist for a follow-up exam and to establish a treatment plan. Basenjis also can be affected by common external eye diseases such as Canine Conjunctivitis; Keratitis; and Dry Eye. In addition, their rough play and curiosity can lead to eye injuries including corneal ulcers or abrasions. See your vet if you suspect play or vegetation may have scratched his eye. Prompt care can prevent more serious injury and vision loss. If your besty suffers from regular tearing, keeping the area where he spends his time as dust-free as possible can help. But see your vet if he starts tearing suddenly.